The AlphaPix pixel controller has the ability to output legacy, DMX 1990 / E1.11 data using RS485 to legacy controllers such as the EasyPix, common dumb RGB and non-RGB controllers and devices such as legacy Light-o-Rama controllers. Note that cable will vary based on specific controller and customer requirements. All HolidayCoro RS485 DMX based controllers work fine with CAT5 cable. 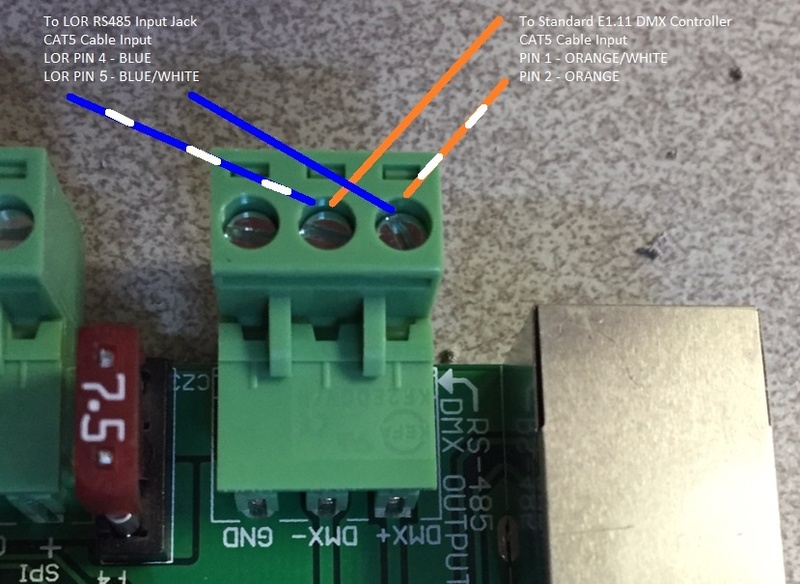 Wire positive (+) and negative (-) wires from DMX controller to the corresponding connection point on the AlphaPix RS485 plug. 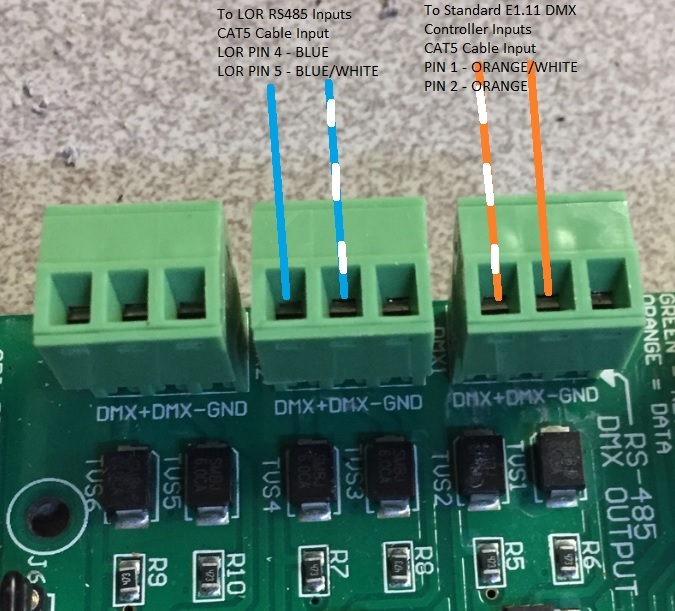 It is not normally necessary to connect the third wire labelled "ground" or "GND"
Configure E1.11 DMX controller to DMX start address 1 (advanced users may need to configure a different address). Typically this will involve setting a DIP switch, if so, see our DIP switch chart page. On the AlphaPix controller, using the web interface, configure the DMX universe(s) for the selected RS485 output. Typically this universe number will be unique from any configured for the SPI outputs, if you are unsure, enter 99 for the universe. Configure your sequencing application to output data to the E1.31 universe (e.g. 99) and configure the DMX start address as "1". This will vary by sequencing application, if you are unsure, contact your sequencing application vendor. Add additional channels or "controllers" as needed to cover all the DMX channels used on your controller (e.g. 3, 27, 30, etc).